The honey in the marinade and a quick turn on the grill give this pork delectably crunchy caramelized edges. When outdoor grilling is firmly within "Dad's territory" but you want to treat the father in your life to a relaxing and tasty day off, prepare this easy grilled pork recipe. Supportive family members can prepare the marinade, dipping sauce, rice and accompaniments, then stand back and let Dad handle the main event of quickly grilling the meat. The sweet, sour, tangy and earthy flavors elevate this dish way above your typical backyard fare, and yet the ingredients are readily available in most markets. Feel free to swap in shoulder chops (which require no skewer), chicken breast or even tofu, and pair with a succulent Riesling—we've provided 12 recently rated examples below. Happy Father's Day! 1. Place the pork in a sealable plastic bag, non-reactive casserole or wide bowl. Whisk together the remaining ingredients and pour over the pork, gently tossing to evenly distribute. Cover or seal and refrigerate at least 6 hours and up to 24. 2. Preheat the grill or broiler. 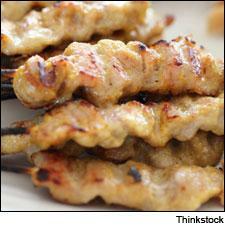 Remove the meat from the refrigerator and thread each piece onto a skewer. 3. Cook the meat over medium-high heat for about 3 to 4 minutes per side or until cooked through. Combine all ingredients in a mixing bowl, and whisk well to fully incorporate. Serve the skewers on a platter, with the rice, accompaniments and individual bowls of the nuoc cham dipping sauce alongside. Serves 4 to 6. This succulent white is filled with plush red peach, cherry and white currant flavors that are supported by zesty acidity. Long and creamy on the finish, offering plenty of spicy overtones. This is impressive for the category. Drink now through 2016. 100,000 cases made.—K.M. Features a racy edge to the apple, green peach and citrus flavors. This is lithe and fresh-tasting. Crisp acidity lends zesty purity and verve to the finish. Drink now through 2018. 3,500 cases made.—K.M. Very savory and lush, with fine balance and texture to the ripe apple, wild plum and dried citrus flavors, lending this a subtle complexity. Lilac and beeswax notes emerge on the spicy finish. Drink now through 2016. 36,000 cases made.—K.M. Shows lively snap to the lemon-lime and fresh-cut apple flavors, featuring some saline and minerally notes. The finish is crisp and zesty. Drink now through 2020. 9,000 cases made.—K.M. A fresh and open-textured white, offering inviting flavors of slate-accented pear and lime that pulse pleasantly on the dry finish. Drink now through 2019. 5,000 cases made.—H.S. Light, sleek and dry, with ginger and lime overtones to the apple flavors, finishing crisp and expressive. Drink now through 2016. 11,500 cases made.—H.S. The green apple, peach and savory herb flavors are fresh and lively in this bright white. Interesting notes of vanilla emerge on the finish. Drink now through 2016. 5,000 cases made.—K.M. Effusively fruity, with an enticing mix of peach, apricot and pear flavors, layered with floral accents and plenty of spice. Finishes with hints of lemon curd and crème brûlée. Drink now through 2016. 6,000 cases made.—K.M. Juicy Key lime, kiwi and green apple notes are backed by bouncy acidity and a bright finish. Drink now. 5,727 cases made.—J.M. Offers grapefruit, melon and quince flavors, with notes of tropical fruit and spice. Finishes a touch austere, showing hints of salted almond and flint. Drink now through 2016. 10,500 cases made.—K.M. The roasted peach and Golden Delicious apple flavors are accented by notes of tarragon cream. Offers a broad finish, with hints of smoke and spice. Drink now. 30,000 cases made.—K.M. Lightly sweet, with a tangy edge to the ripe pear and lychee flavors, finishing with some length. Drink now. 16,600 cases made.—H.S.